Strahov Library - Philosophers’ Hall: Creating a new library with a Classicist Philosophers’ Hall in the era of abbot Václav Mayer represented a grand crowning of the Strahov area building development. By creating a library which he made accessible for public, the abbot prevented the abolition of the monastery in the Joseph’s era. Moreover, the abbot was close to Joseph II, and he had the front gable of the Strahov library decorated with a medallion of Joseph II - an enlightened ruler who appreciates the value of the library. The library was created by transforming the former granary. Soon afterwards, the library was rebuilt and adjusted to suit the library interior from the abolished Premonstrate temple in Louka near Znojmo, whose books the Strahov abbot managed to acquire. The walnut wood library was built in Prague in the years 1794 - 1797 by the original author Jan Lahofer of Tasovice. The highest lines of books are only accessible from a gallery, to which there are spiral staircases in the library corners, hidden by fake spines of books. In 1794, Anton Maulbertsh painted the library ceiling with a theme Journey of mankind to wisdom, according to the painting in the library in Louka. The library is by far not only focusing on religion; there are also medical, pharmaceutical, mathematical, juridical, philosophical, geographical, astronomical, and other books. The hall is 32 m long, 10 m wide and 14 m high. The library had a really remarkable place in the education development, also in the time of the national awakening. Shortly after 1989, after the restitution of the Premonstrate property, the Strahov library was also returned to the original owners - the Royal Premonstrate Canonry at Strahov. 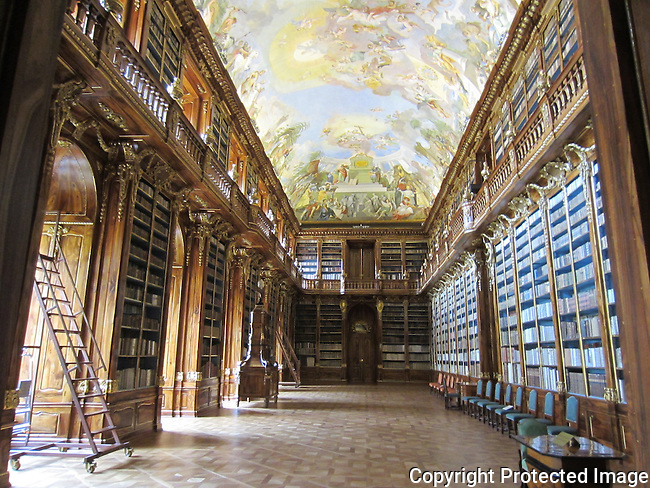 The Strahov library collections contain around 200,000 books, old prints, first copies and manuscripts.